A fundraising event in Louisville is designed to fail, destined to thud like a lead balloon with University of Louisville fans. 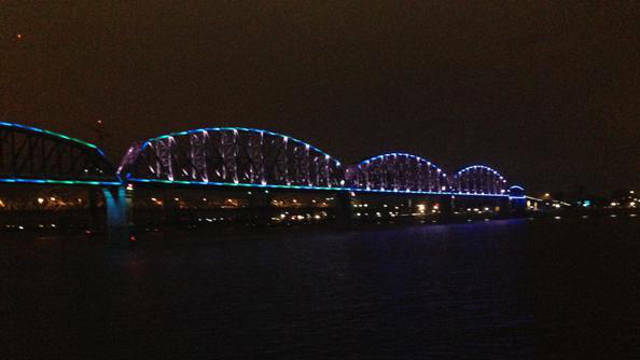 Some people with too much time on their hands at the Waterfront Park decided to pit the UofL against the University of Kentucky in a bridge-lighting competition in UofL’s home town. A bull-in-a-china-shop kind of terrible idea, a concept sure to offend every UofL fan in the city — the potential of lighting a major attraction in honor of a hated rival on a major local landmark. Some PR novice obviously at work, embarrassing UofL fans with the very idea. 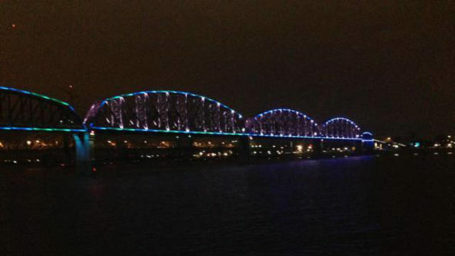 The winning side having its colors light up the Big 4 Bridge before the rivalry basketball game on Wednesday. An in-your-face kind of slight which will ensure that the losers have negative vibes for the local attraction. No doubt David Karem, the president of the Waterfront Development Corporation and a UofL Law School grad, was out of the office, out of town, or out of his mind when the concept was approved. We’re pretty sure the majority of funds for the waterfront park have come from Louisvillians and local companies. This is one observer who would not even consider making a contribution to the project. 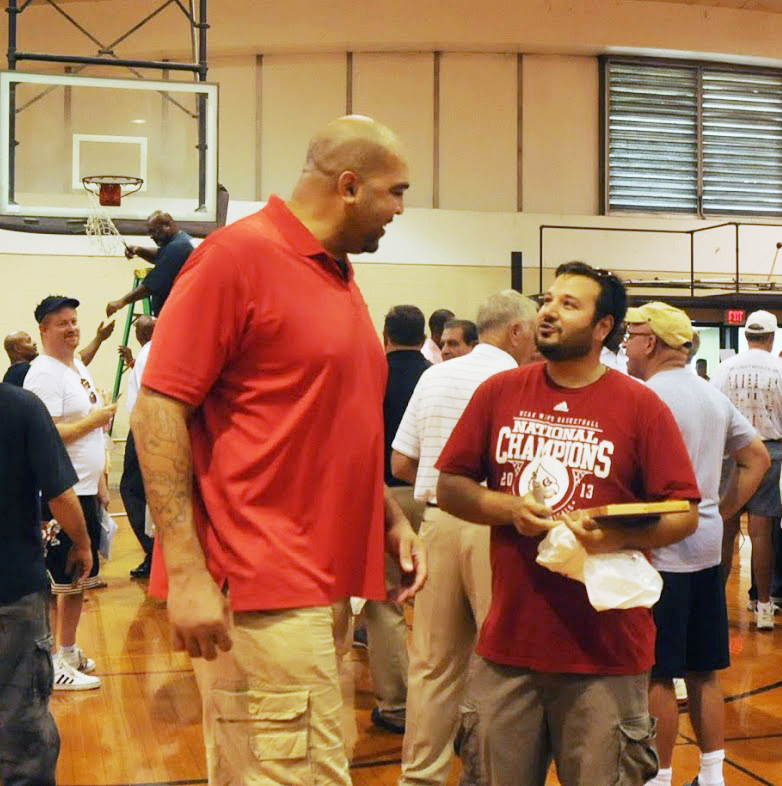 And we doubt that more than a handful of other UofL fans will get involved in the project. As of 10 a.m. on Friday, UK fans had donated $434 as opposed to $134 for UofL fans. Not surprising that Louisville fans are not getting involved. They shouldn’t have to even consider it. Few UofL fans will support it. This is one event that the Kentucky Sports Radio web site is sure to get behind because it provides UK fans with an opportunity to insult UofL fans in their own hometown. They will give big. That we can understand. What’s impossible to comprehend, however, is why the Waterfront Development Corporation would prostitute itself raising funds at the risk of embarrassing the primary base of support for the Big 4 Bridge. Would anyone be surprised if Tom Jurich has not already commissioned artistic renderings of a new basketball arena for Belknap Campus in case the University of Louisville agreement with KFC Yum! Center were to fall through. The rendering would be of a first class, state-of-the-art arena, of course, with all the “wow factors” that Jurich insists on when considering any new facility. My guess is that the new campus arena includes approximately 19,200 seats and will fit comfortably on the 13.5-acre site previously occupied by the silos. 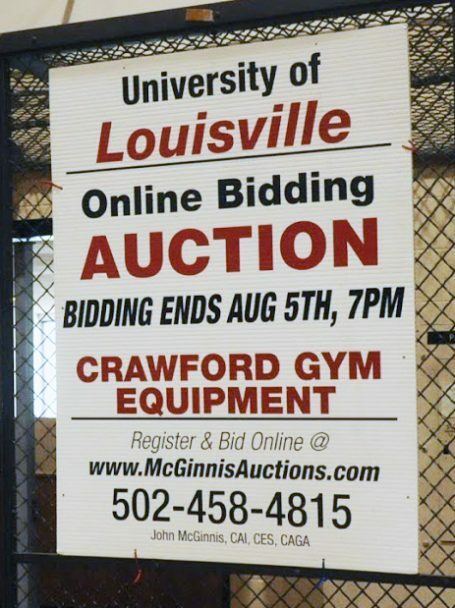 UofL already owns the land and an arena at that location would be much easier and affordable to construct than downtown. Plenty of room on the site, too, for a hotel and conference center, including all the parking spaces needed for all the new facilities. The site would be convenient for the men’s and women’s basketball teams, just minutes from the practice facilities and the dormitories. Great for the volleyball team, too, as well as for other indoor sports. 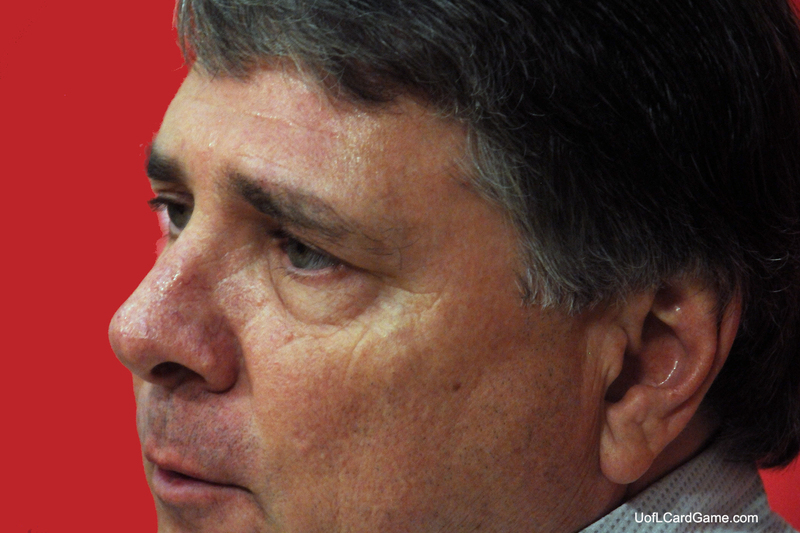 Jurich is not in any rush to abandon the KFC Yum! Center where UofL men’s and women’s teams have competed since 2010. But he is tired of hearing some city officials blaming UofL for financial problems with the the arena. He addressed the issue recently during a meeting of the Central Cardinal Club at the PNC Club at Papa John’s Cardinal Stadium. The likelihood of UofL building an on-campus arena is probably pretty remote, unless the city were to somehow manage to attract an NBA franchise to the city. Some people have been talking about it for 40 years, with no NBA owners or general managers ever expressing serious interest in the city. Jurich proved a decade ago that he was a “team player” by going along with the downtown arena, despite badly wanting the arena on campus in the first place. He went ahead despite his reservations and better judgement but was able to negotiate excellent terms for UofL. No one should doubt Tom Jurich will do everything he can to make the current arrangement with the KFC Yum! Center a long-term success. But they also should not doubt that Jurich firmly believes the best possible place for a basketball arena is on the University of Louisville campus. 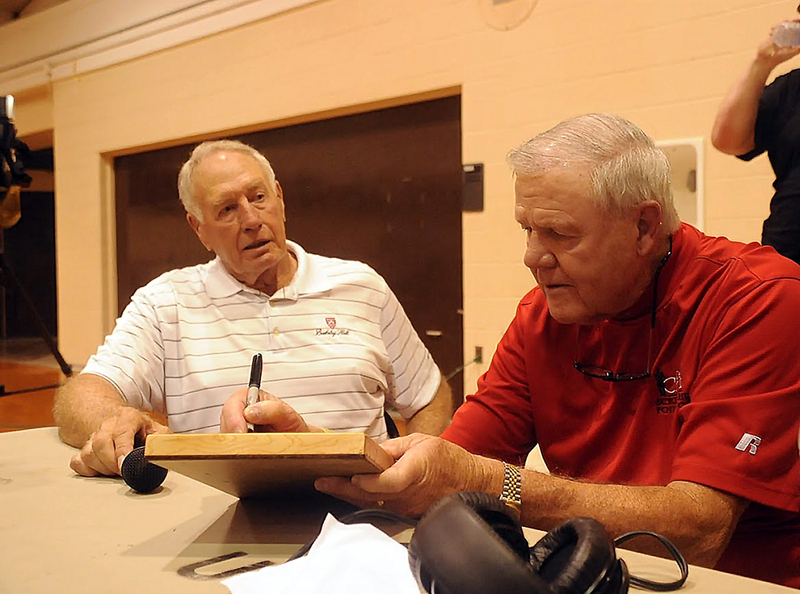 Bill Olson, former Athletic Director and Assistant Coach, reunites with Denny Crum. Large segments of the floor have already been removed, a sign near the entrance encourages fans to go an online auction, and Crawford Gym is host to a going-away party. Darrell Griffith is there, along with dozens of former University of Louisville basketball players. Among them Philip Bond, Jerry Eaves, Wiley Brown, Roger Burkman, Mike Grosso, Robbie Valentine, just to name a few. Manuel Forrest is there, too, cutting snippets of the nets down for teammates and fans. Denny Crum, Bill Olson and Jerry Jones, among the former coaches on hand, Denny autographing small segments of the floor to raise money for the UofL scholarship fund in his name, sharing memories of the old days on the Jerry Eaves radio show. Felton Spencer shares memories of his days in Crawford Gym. Crawford Gym, which was constructed in 1964, became a reality after a gift of $467,000 was made from the estate of Matthew Crawford by his sister Kate Crawford and Jennie Hanks, with additional money from the city. The facility included two regulation-size maple basketball courts, which were also used for volleyball, gymnastics and intramurals. It was lighted by 64 mercury-vapor lights. The roof was the first elliptical paraboloid in the midwest, a type of roof eliminating supporting posts. There was never any air conditioning. 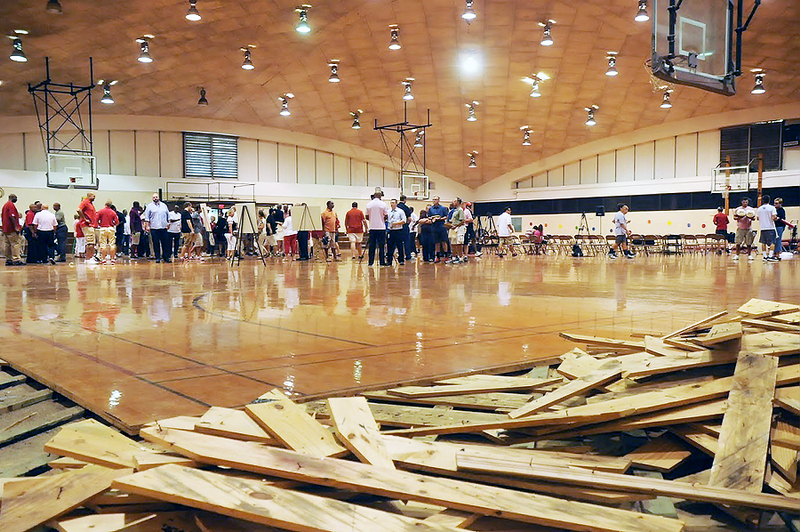 Crawford Gym will be coming down later this month, making way for a much-needed multi-million-dollar instructional facility. Jim Ramsey is going over some notes with his administrative assistant in the University of Louisville Foundation offices Friday morning when they are interrupted by the messenger. Back at work before heading off for some R&R. That’s exactly what it means, the decision by Franklin Circuit Court Judge Phillip Shepherd granting an injunction to Attorney General Andrew Beshear. The decision places Gov. Matt Bevin’s order restructuring the UofL Board of Trustees in legal limbo. Whether Ramsey’s resignation as President to the new board is final is anyone’s guess. The only thing certain is that there will be further judicial proceedings before anything is settled. And, believe it or not, Ramsey actually had seven days from the day he signed the agreement to change his mind and rescind the agreement if he so chose. If the courts declared Bevin’s order null and void, he could face the possibility of going back to work for the old board. Not likely that he would want to resign twice, or give some of the original trustees the satisfaction of seeing that happen. 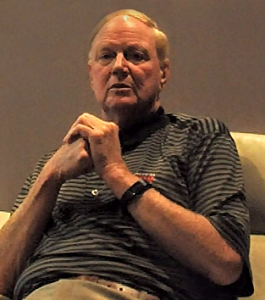 Since his “resignation” on Wednesday, Ramsey has turned his full attention to the University of Louisville Foundation. He intends to retain his position as ULF President, continuing to raise funds in support of the University. For the time being, however, he intends to get some rest and relaxation. He and Jane Ramsey are heading out this weekend with the family for seven days at a resort in North Carolina. “It will be good to get away for a few days,” he says in the understatement of the week.